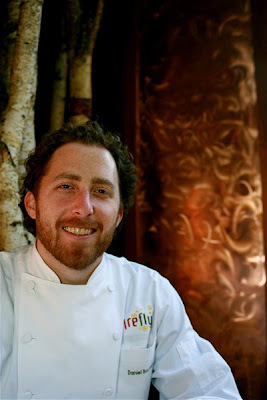 Daniel Bortnick, executive chef at the cozy Firefly in the Hotel Madera, has DC food roots that run deep. Get this: his grandparents owned a neighborhood grocery on the same block where Firefly sits today. His great uncle was also a DC restaurateur, known as "the Watermelon King" for handing out melon to local kids. Bortnick attended the California Culinary Academy in San Francisco, before cooking in kitchens that included Mendocino Grille and Poste. Maybe the chef is thinking of another Peruvian chicken place? El Pollo Rico doesn't have yucca fries listed on the menu online or at their Clarendon location. French fries (i.e., steak fries) and coleslaw, but no yucca. It's been a while since I've been to the Wheaton location, so maybe there? my wife and I had our first real date at the Helmand! Perhaps its time to make a return trip? there are definitely NO yucca fries at el pollo rico. is he thinking of super pollo down the street? THEY have yucca fries.